This morning, I sit on the deck praising God for a gentle rain and cool temperatures as I enjoy a cup of hot spiced pumpkin tea. Autumn is in the air; my favorite season of the year. I start thinking about sweaters, soups, and all things pumpkin! Today I am sharing one of my favorite pumpkin recipes. 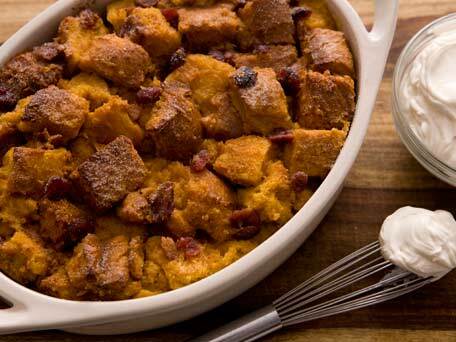 This PUMPKIN RAISIN BREAD PUDDING recipe came from The Inn at Richmond and is one of my go-to recipes for holiday brunches. I love it because it is easy to put together and can be assembled the night before. Spray a 9×13 baking dish with Pam. Tear bread slices into bite sized pieces into the dish and set aside. In a saucepan, simmer the milk and Half and Half with butter, sugar, and raisins until sugar dissolves. Thoroughly mix pumpkin, eggs, maple syrup,vanilla, nutmeg, cloves, and salt. After milk mixture has cooled somewhat, mix a bit of it into the pumpkin mixture. (If milk begins to curdle, stop and let it cool further,) Whisk all the mixtures together and pour over the bread. Allow to soak at least an hour or as long as overnight, pressing the bread into the liquid to absorb. Heat oven to 350. Sprinkle the cinnamon and sugar mixture over the bread pudding and bake for about 45 minutes. Brush with a little Half and Half and return to the oven for a few minutes to allow the sugar to melt into a glaze. Serve warm with whipped cream, maple syrup, or cranberry compote. Even though I found this picture on the internet, this is exactly what mine looks like. :)) I’ve been making it for years and everyone loves it! Enjoy the dish, enjoy the season, and rely on the One who’s in charge of everything!